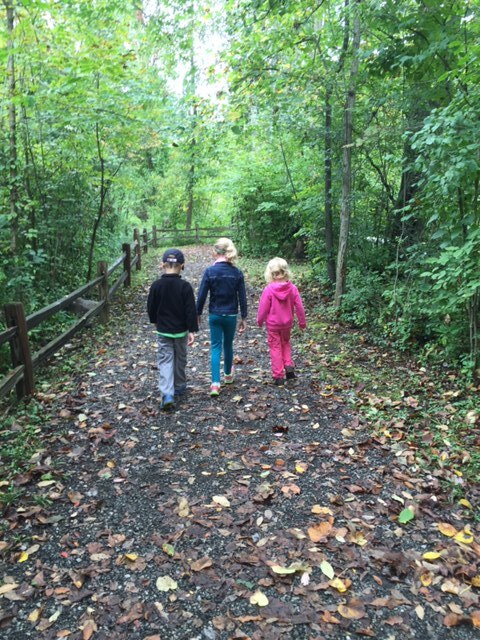 I enjoy hiking our local nature trails and try to pass that love to my nieces and nephew whenever I get the chance. They all thankfully seem to appreciate the outdoors too, which makes me very happy! Lower Michigan is enjoying some nice weather as we come upon the end of September so I took advantage of the mild temps to take my youngest two nieces and nephew hiking (ages 8, 6 and 4). We’ve been to Dinosaur Hill in Rochester a few times so I decided to head to Stony Creek Metropark in Shelby Township. The park covers 4,461-acres across Oakland and Macomb counties. There are lots of activities to do throughout the year, including visiting a great nature center that also has several miles of groomed trails surrounding it. The older two previously hiked there with their cousins and me but this was the first visit for the youngest. She was pretty excited to ‘get in the woods’ (as she said!). Let them lead the way. When the trail is wide enough, we all end up hiking alongside each other as we talk and point out cool things in the woods. However, when it narrows, I usually ask one of them to lead (my nephew loves this request). This makes them feel special that you ‘trust’ them to take the lead. The good thing about Stony Creek trails is that they either intersect, end up at the nature center/parking lot or circle back, so you can’t get lost. An adult should always bring up the rear of the group to ensure no one wanders off or falls without any notice. Let them carry a small backpack with water and a snack. Small backpacks shouldn’t be too heavy but I’ve found that my nieces and nephew like to feel involved in our activity so want to help carry stuff. Great for me so my pack isn’t too heavy! While I carry my water, sunscreen, wipes, first aid kit and a few other items, a small water bottle and granola bar are perfect for them. I discovered snacks are a big motivator to keep the youngest moving (she was starving 5 minutes into the hike, even though they finished breakfast right before we left)! We found a clearing with a bench where we could take a short break, eat and talk about what we’d seen so far. Even though the kids are definitely taught to not litter, I was so proud that my 8-year-old niece reminded her siblings to put their wrappers in the backpack to carry out. Show them the map and let them pick the trail to hike. 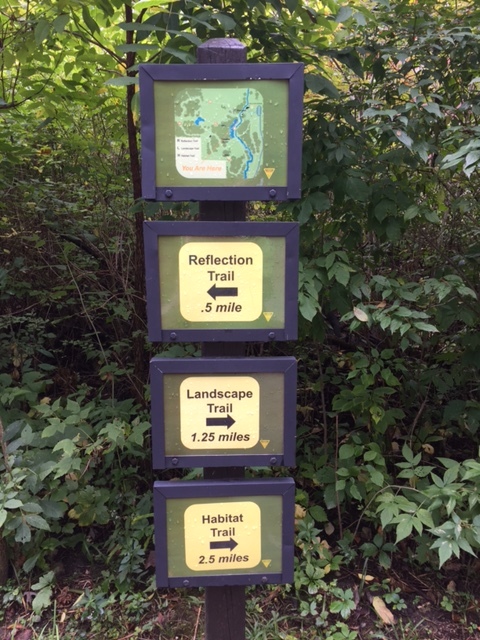 There are good trail map signs at the start and throughout the nature center trails so we stopped to read the map as a group. I gave them a few options of trails we could hike, then left it to them to decide (although when they couldn’t agree, I had to play the ‘pick a random number’ game before we stood for hours!). As we encountered trail signs and maps along the trail, they were excited to check our progress. These interval trail maps also helped encourage and motivate our littlest hiker! Make it fun! I sometimes will make a scavenger hunt list so that the kids have something to look for while we’re on the trail. Examples of item to include are leaves, certain color flowers, squirrel, chipmunk, deer, bird, snake, etc. Signage along the trail gave us a peek into the history of the area – we learned the area was once a family’s backyard, which really impressed the kids and led to some great conversations about playtime and our ‘dream’ backyard. Go to the bathroom before you get on the trail. We always ‘try’ even when everyone says they don’t have to pee – and every time we all end up happy we tried. Give them a camera and let them be creative. I love seeing the world through other people’s eyes. We’re all so different and appreciate various things. The kids love taking pictures so this makes it fun for them. Dress appropriately for cool or warm temps. Let them wear ‘old’ shoes or some that can get dirty so you can let them be kids and not worry about getting dirty while outdoors. Of course, all the same I do encourage them to avoid jumping into the middle of a mud puddle on the trail (just because I like my sister!). Teach them about Leave No Trace, which teaches people how to enjoy the outdoors responsibly. We talked about staying on paths rather than traipsing through plants, never littering, and respecting nature and wildlife since the woods are home to plants and animals. Please don’t forget to apply sunscreen – on children and adults. Have patience. I never start these outings with any preconceived notion we’ll hike a specific length of the trail or that it will be a quick trip. Just the preparation at the car (put on or remove jackets, check shoe laces, apply sunscreen, put on backpacks, and more!) takes plenty of time. When I take the kids hiking, I’m there to spend time with them, sharing something I love and hoping they develop a similar interest/love. These are truly moments that are about our time together. When we are leaving the park and they ask when we can go back, then I know it was a successful, special outing for all of us. Have you hiked with children? What tips do you have to share?